Considering your first indoor skydiving experience? Here are some indoor skydiving prices and rates that should help you make a decision. One of the great things about indoor skydiving is that almost anyone in good health and fitness can try it. 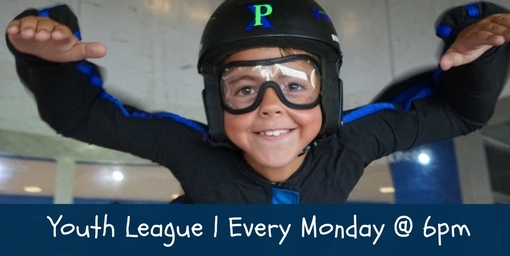 At Paraclete XP, we regularly welcome first time flyers of all ages and experience levels. If you’re ready to experience something extraordinary, read our list of indoor skydiving requirements below or contact a member of our team with any questions you have. We hope to see you soon at Paraclete XP Indoor Skydiving. Do not have a history of neck, back, or heart conditions. Check with your Doctor. Those who wear glasses can be supplied with goggles that can be worn over them. We will do our best to safely fly anyone with a disability in our wind tunnel. If you are a person with a disability and want to experience the joy of indoor skydiving, please contact a member of our staff to discuss whether we can accommodate your needs. Your safety is always our number one priority! All participants of Paraclete XP SkyVenture are required to sign a waiver form. All minors under the age of 18 must have parental consent signed by each individual's parent. Please download, sign and present on the day of your appointment. Top notch! Instructor John was awesome! There is nothing like soaring, weightless. Staff was great and I even got to watch some of the pros practicing formations before we flew.